Iranian tourists who came to Turkey's eastern province of Van for Nevruz holiday showed high interest in the ongoing Van Shopping Festival and hotels in the city have reached almost full occupancy. Many Iranian tourists have come to Turkish cities to spend their 13-day Nowruz holiday, which is the Persian new year and celebrates the coming of spring on March 21 every year. Iran tourists have come to cities such as Van, Antalya and Marmaris. Iranians came to Van, an eastern province, through the Kapıköy Border Gate and flew to Van Airport. Eight more flights from Iran to Van were added to meet the high demand. The Van Shopping Festival, which is currently running has been a good opportunity for Iranians who want to shop. The city's hotels also have high occupancy rates. An administrator at a local hotel in Van, Reşat Yeşilağaç, said that the local shop owners are very pleased to see Iranians in the city. The hotels in the city reached almost full occupancy, he said, and apart from hotels, rental houses and apart hotels are also full. He also said the number of tourists visiting the city increases each year - a strong indication of how much Iranians are pleased with their vacations in Van. Shopkeeper Ercan Tarhan said that Iranians are important for the city's economy. "Last year, Van welcomed 500,000 Iranian tourists last year," he said, citing how they contribute to the economy. Iranian tourist Zehra Bayis said that Van is very close to Iran and that she came to the city for a concert, shopping and to see the Lake Van. Antalya and Marmaris also welcomed visitors from Turkey's eastern neighbor during Nevruz. Iranian families enjoy Antalya with their children at local hotels, which are fully prepared to serve customers who celebrate Nevruz. The hotels design their menus and entertainment activities to Iranian tastes. 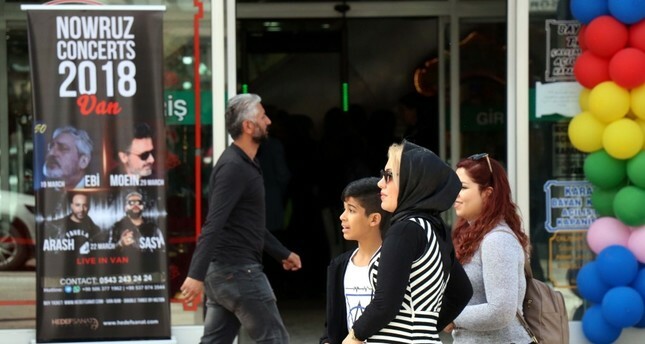 Turkey's holiday resort province of Antalya also welcomed Iranian artists for events organized for visitors. Zehra Nasiri, who came from Tehran to Antalya for Nevruz, said she had been coming to the city for 10 years, adding that she also visited İzmir, Istanbul and Ankara. "God really created Turkey as a heaven, it is a very beautiful country," she said. Explaining that their primary reason for coming to Antalya was the holiday, Nasiri said: "We are resting, but shopping is also important for women. At odd times, we go to the malls to shop." Tehranian Sayed Javid said he came to Antalya on holiday with his friends from his music group, as well as to entertain Iranians for Nevruz. "I am here for the first time. I am really happy to be here, Antalya is a beautiful city," Javid said. Mediterranean Touristic Hoteliers Association (AKTOB) Chairman Erkan Yağcı said that Iranians bring a three-week revival to Antalya. Yağcı said that Antalya saw 40,000 Iranians last year during Nevruz and the sector expects the same number this year. He said that the problem with flight permits still continues, and the number will further increase if this problem is solved. Professional Hoteliers Association (POYD) board member Ali Kızıldağ said that the Nevruz break has just began and the number of Iranians coming to Turkey will rise in the coming days. On the weekend, the Marmaris district in Muğla, another holiday resort, saw 1,200 visitors from Iran. A local hotelier association representative said that the district expects to see 8,000 Iranians this year. Hoteliers Association of Turkey (TÜROB) Chairman Timur Bayındır recalled that 2.5 million Iranians visited Turkey last year and Turkey sustains its position as a top tourism market for Iran. He said that Istanbul and Van will see a large number of visitors from the country. He also said that 250,000 Iranians came to Turkey in March 2017, and one-third went to Istanbul and the rest are in Van and other cities. Tourism professionals expect to see a 10 percent to 15 percent rise this year, he said. Cited high demand for Istanbul and Van and said Taksim and Sultanahmet particularly receive high demand from Iranians and all the hotels in Van will reach full occupancy.